Bedsores are damaged skin caused by a lack of proper blood flow to the skin because of pressure. The bedsore can occur in individuals at any age when bedridden, in a chair or wheelchair without the ability to reposition themselves. The sore occurs from even minimal pressure on the skin when in contact with a bed, chair, wheelchair, splint, cast, or hard object such as a poorly fitting prosthetic (artificial device). These decubitus ulcers usually appear over a bony prominence like the elbows, ankles, heels, tailbone or hipbones. 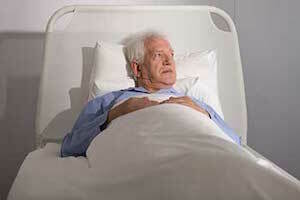 However, because of the common causes of bedsores, an ulcer can occur at any point on the body. Bedsores can develop while hospitalized for different medical condition, in a nursing home or an assisted living facility. Even a small bedsore can lengthen the stay in a medical facility, until it has been treated properly. Bedsores are often life threatening when left unattended, improperly managed, or when caused by an underlying condition that minimizes its potential to heal. Pressure – Any pressure from an object including a bed or chair can reduce the flow of blood to the skin, especially over bony areas. When the blood flow is restricted for even a few hours, the skin can die, starting at the outer layers (epidermis). Next, a breakdown of the dead skin can lead to an ulcer (open sore). Healthy individuals usually do not develop bedsores. This is because most of us reposition our body without thinking, even while asleep. Traction – Any type of sheer force can restrict blood flow to the individual skin. Sheer force traction tends to stretch the skin, like when individuals incline or are propped up in bed. This is because forces of gravity naturally draw down tissue and muscle under the skin. However, outer surfaces of the bed, chair or other object hold the skin’s top layers in place, creating pressure and eventually a bedsore. Friction – Repeated friction by continuously rubbing against bedding or clothing can develop or worsen existing pressure ulcers. Over time, friction can wear off the skin’s top layers, such as when being repeatedly pulled across bed linens during repositioning. Moisture – Older individuals and healing patients can suffer bedsores caused by excessive moisture that weakens or damages the skin’s outer protective layer. As an example, any skin with extended contact with urine, feces or perspiration can easily break down, causing a pressure ulcer. Malnutrition – Dehydration and malnutrition tend to increase the potential of developing a decubitus ulcer. In addition, the lack of proper nutrition can slow down the healing process. Individuals who are undernourished often lack sufficient body fat necessary for cushioning muscles and tissue, particularly when deficient in zinc, vitamin C and/or protein. Even though many pressure ulcers cause significant itching and pain, when senses are dulled, the patient may experience no painful symptoms at all. A bedsore is categorized by how severe the damage is to the soft tissue. In many incidences, a decubitus ulcer can progress quickly to severe stages, with the first noticeable signs appearing in stage III or IV. Stage I – Pinkish or reddish unbroken skin, sometimes challenging to see on darker skinned individuals. Often times, the sore is firmer, cooler, softer, warmer or more tender than skin in the nearby area. No ulcer is present. Stage II – Noticeable shallow skin loss, which could include blisters, abrasions or both. The pressure ulcer is typically shallow in appearance with a red to pink base. Stage III – The skin of the pressure ulcer is worn away, sometimes into the deep layers of fat without exposing bones or underlying muscle. Stage IV – Worn away skin, exposing underlying bones, tendons and muscles. Non-Stageable – When the decubitus ulcer is covered with eschar (a crusty, thick surface) or debris, it sometimes cannot be properly staged through assessment. Deep Tissue Injury – Maroon or purple unbroken skin area that feels cool, warm, mushy or firm when compared to surrounding tissue. Usually, individuals who do not have the ability to move around have a greater potential of developing bedsores, when restrained, sedated, very weak, comatose or paralyzed. With proper care and skin management, bedsores are almost always preventable. If you or a loved one has suffered from any type of pressure ulcer while under the care of a hospital, nursing home or assisted living facility, you can likely seek financial recovery for your damages. Call Nursing Home Law Center LLC (800) 926-7565 for a free initial consultation to speak with an experienced attorney concerning your claim. Our attorneys have helped hundreds of families from across the United States recover maximum compensation for injury caused by bed sore acquired at medical facilities and care centers. Let us help you.